Sean Harris (24 Hour Party People) stars in the grim and dark indie film Possum (2018) as a neurotic, disgraced former teacher who returns to his decrepit childhood home after becoming a suspect in the disappearance from a local boy. The place was charred years earlier by a fire that killed both his parents, though the place is still inhabited by his crusty and ill-tempered uncle Maurice (Alun Armstrong, Sleepy Hollow). From the start of the film Philip carries around with him a leather bag, at first we only glimpse the contents, but we discover that inside it is a creepy puppet he's created, a nightmare effigy with a haunted looking human face with long spider legs, it's a horrible looking thing. Throughout the films run time Philip looks to be rid of it by dumping it in the woods, submerging it in water and burning it, but the things keeps returning to him, like a childhood trauma that won't go away. The horror here is of the psychological kind, bringing to mind David Cronenberg's Spider (2002), with Sean Harris turning in a very fine performance as the childhood trauma-scarred man. Tiny bits of his past keep bubbling to the surface of this dark film, but it's a bit on the surreal side with more visual impressions than straight-up storytelling, a choice I will assume might befuddle some watchers of the film, but it certainly tapped into my love of arthouse cinema. The setting in a dour looking small British village is brown-stained and drab, the color palette having the appearance of a nicotine stained wall paper with mossy highlights, it feels cold and with some creepy animations of the spider puppet, and surreal imagery of balloons enveloped by smoke. There's also the recitation of a dark children's poem which seems to be the creation of Philip, accompanied by some unsettling drawings, all this coming together to create a unsettling bit of psychological sadness filled to the brim with dread. While I dig it quite a bit the film does have the feel of an interesting short story stretched to feature length, luckily we have Harris' turning in a fine performance to anchor the film, and some nightmare imagery and dark subject matter that keeps the gears turning right up till the end without over extending the premise. Audio/Video: Possum (2018) arrives on DVD from Dark Sky Films in anamorphic widescreen (1.85:1) with English Dolby Digital 5.1 with Optional English subtitles. Extras include 58-mins of interview with actors Sean Harris and Alun Armstrong, director Mathew Holness, and producer James Harris, plus 11-mins of behind-the-scenes footage and a 2-min trailer for the film. 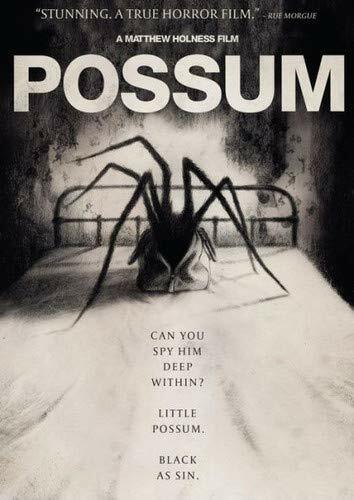 Possum (2018) is not gonna a film for the general horror audiences, but if you dig dark, psychological thrillers with a slow-burning pace and a strong lead performance this is a bit of n indie gem.